Hamas says 14 Palestinian Arabs wounded by Israeli fire as "March of Return" riots continue. 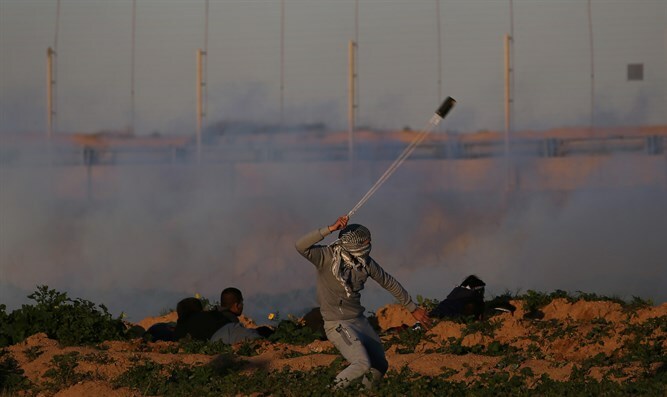 The violent riots along the Gaza border continued on Friday, with the Hamas-run “health ministry” in Gaza saying that 14 Palestinian Arabs were wounded by Israeli fire. The ministry said the 14 were shot, including two medics, but did not report that any were in life-threatening condition. Thousands of demonstrators gathered in multiple locations along the border, though clashes were less intense than in previous weeks, according to AFP. An Israeli army spokeswoman said approximately 14,000 Palestinians took part in "riots" along the border, with protesters "burning tires and hurling rocks at (Israeli) soldiers". Troops responded "in accordance with standard operating procedures", she added. The so-called “March of the Return” border riots have been held every Friday since March 30. In recent weeks, the protests had not been as violent as they had been when they started. However, the violence has flared up again over the past two weeks, likely due to the fact that Israel halted the transfer of Qatari money into Gaza, following escalation in the south earlier this week. Yisrael Beytenu chairman MK Avigdor Liberman on Friday called on the government to continue to withhold the Qatari money from Gaza. "Friday has come and with it, as usual, the wild behavior on the border of the Gaza Strip. 14,000 rioters at five locations, much more than last week, and Hamas' restraint forces are nowhere to be found,” Liberman wrote on Facebook. “This is another stage in the Israeli government's surrender to Hamas. The prime minister who promised to topple Hamas has become its main financer,” charged Liberman.